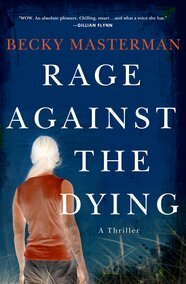 I picked up a copy of Becky Masterman's debut thriller, RAGE AGAINST THE DYING, thanks to a review by another author. From the first chapter, this one never let go of me. Brigid Quinn, age 59 and noticeably white-haired, is reluctantly retired from her FBI position where she hunted sexual predators. Haunted by what she's seen over the years, she's trying to fit into a new role: wife to the gentle and unquestioning Carlo, a former priest who hasn't asked her to go beyond her usual reply to people who ask what she used to do: investigate "copyright infringements," she'll tell them, ready for their baffled blink and a change of topic. But Quinn's long-time psychologist friend David Weiss, nicknamed Sigmund, isn't afraid to analyze Quinn and her choice to settle in Tucson, Arizona, where her effort to catch a Route 66 predator went very wrong. It's the case she never quite solved and can't let go. And it's rotting something inside her in a way that doesn't bode well for marriage or even for retirement. So when Floyd Lynch confesses to the string of crimes, and Quinn becomes persuaded that the confession is flawed, she's suddenly investigating -- without badge or authority, and with some truly awful judgment calls. Who knows how they all thought I'd react? His mission accomplished, [police investigator] Max relaxed his spine and let himself get sucked a little into the overstuffed couch. "Don't worry. We're waiting for verification before we do that, but it was time to let you know. Your involvement in the case, I mean." But Max has also alerted David Weiss, and nothing is as it seems -- not even Quinn's homelife. A gripping thriller, well paced and worth the read. I wasn't totally convinced by the very last details of Quinn's path here (a slightly incongruous note compared to the rest of the book, I thought), but I am totally ready for sequels. Becky Masterman has the right stuff. 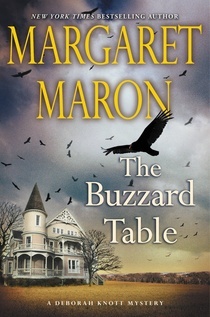 THE BUZZARD TABLE is the 18th of Margaret Maron's Judge Deborah Knott mysteries, and a crackling good one. Series followers will grab and gobble; for me, the book was a reliable treat, waiting for a calm moment when I could just keep on reading . . . I knew I wouldn't want to put this down very often. And that's what it is for a writer to become a Grand Master. There are a goodly number of these strong, steady authors who know pace and character the way they know breakfast, and who braid unexpected strands and glittering red herrings like extra courses of dinner. But Maron's writing is more than this -- she is a recognized Grand Master, thanks to her 2013 Edgar Award, as well as recognized in her home state of North Carolina, where she sets much of her writing. And she has the patience to work with a story until its layers are satisfying and rich. Without carrying the metaphor too far, I could say Maron knows her workroom and insists on making the dish come out right. In this case, Deborah Knott, judge in Colleton County and married for a long time to Sheriff's Deputy Dwight Bryant, isn't as young or adventurous as she once was. Her life balance is now heavier on wisdom and experience. But there are still things that take her into new terrain, like the unexpected reactions she's getting from her young stepson, Cal -- whose mother is dead. She's also puzzled by a visitor to the area, a long-lost cousin of the dying Mrs. Lattimore (that scent in the air is money, plus jewels). Cousin Martin Crawford is an ornithologist. Prickly and defensive, he's set up a "feeding table" for buzzards. Just for photographs -- or for other reasons? And there is the disturbing core of what's going on in Colleton County: Who's waiting to feed off what corpses, and why? Deborah's interest in the situation is supplemented by that of her husband Dwight, and by Sigrid Harald, an investigative lieutenant from New York and the granddaughter of the soon-to-be-late Mrs. Lattimore. Dwight and Sigrid get their own chances to narrate the action, but most of the insight and control are in Deborah's voice and view. Maron readers will recognize Sigrid from her own series, btu this book is great as a stand-alone -- you don't need to be caught up on any of Maron's long-standing narrative strands to enjoy THE BUZZARD'S TABLE. Maron writes traditional mysteries -- death happens, but there are no interludes inside the minds of deviants, and the solution, when it comes, is the result of skilled people working hard to uncover the disturbing secrets around them that may have led to violence. I found the conclusion well crafted and appropriate -- then was haunted afterward by a few provocative strands of moral doubt that Maron leaves dangling. I'm shelving this one on the "read it again" shelf, and look forward to working back through some of the earlier Maron titles, as well as the ones yet to come. Think quickly, which of your gardening implements could make a murder weapon? 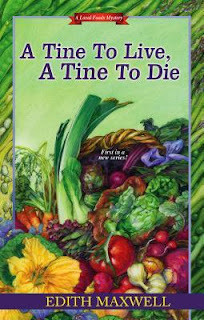 Yep, that one, too ... Edith Maxwell, no stranger to shopping at farmers markets and caring for organic veggie plots, picked the vicious multi-tined pitchfork (think American Gothic, but stronger), for her first "Local Foods Mystery," A TINE TO LIVE, A TINE TO DIE. Cam Flaherty is a new farmer -- her great-uncle Albert St. Pierre has turned over the operation to her, and she's hoping the cachet of organic, fresh, and local will help her make a good living from her new country life, quite a change from Cambridge, Mass. But it's always the people that complicate life, right? And the whole point of a CSA -- that is, community-supported agriculture, or farm shares -- is people being regular purchasers of everything you grow. Among Cam's group of purchasers is Alexandra, "a Viking princess. If princesses wore cutoff overalls and hiking boots with red socks." And there's Felicity, whose long gray braid hangs down her back; the also gray-haired Wes, the silent type; and perhaps most importantly, Brazilian immigrant Lucinda DaSilva, president of the Westbury Locavore Club but otherwise mysterious and not exactly the sharing type. But Cam's plans for orderly operations are brought swiftly to catastrophe when the hired man she's just fired (for almost destroying her organic operation!) turns up dead in a greenhouse structure, lying bloodily between the trays of seedlings. The reporter stood ten yards away in Tully's meadow, what passed for her neighbor's quarter-mile-long front yard. Cam doubted if Tully had given the woman permission. She looked uncomfortable standing in weedy grass up to the knees of her expensive-looking black pants. Her cameraperson appeared to be focusing on Cam. How long had they been there? And now the poisoned rhubarb was going to be on television. "We want to hear your side of the murder in the greenhouse." The drama in the woman's voice could have landed her on Masterpiece Theater. She walked toward Cam, extending a microphone attached to a black shoulder bag. Maxwell paints the trials and tribulations -- and rewards -- of a small farm in bright detail, based on her own experience as part owner of a certified-organic farm herself years ago. Most important for this cozy-with-dark-edges mystery, she tags the motivations that take Cam Flaherty into investigating the crime, when it would be safe (and easier) to leave the detection to the police. Even in the countryside, the blackest dangers are those provided by criminals who don't care what or who they damage. Whether Cam can catch the murderer is one pressing question. The other one is, will she still have a working community-focused farm and a group of willing locavores by the time the crime is solved? This is Maxwell's first detective fiction under her own name, but she also recently started a series under her pen name, Tace Baker. I don't expect she'll have much time for weeding this summer, with two series to write and a lot of twists and turns ahead! I look forward to getting to know Cam Flaherty better as Maxwell's Local Foods Mystery series continues. 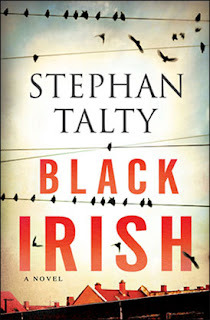 There is nothing in BLACK IRISH that "tastes" of debut author, although it's the first thriller from Miami/New York/Dublin writer Stephan Talty. He's also written five "true" adventure under his own name and was the ghostwriter (I hope with a contract that allows him to say so!) for A Captain's Duty by Richard Phillips. Still, the sustained pace of an Irish-linked suspense novel set in Talty's hometown of Buffalo, New York, takes a different set of skills than biographies of tumult and danger. As Detective Absalom ("Abbie") Kearney tackles police work in her own hometown of Buffalo, after a prolonged absence from the Irish district in which she's grown up, there's a lot of doubt about whether she can handle the job. It's not her background that's lacking -- other police officers are lining up to work with her, as she has that special grit and insight that bring top results. But in the County? That part of Buffalo that has no tolerance or kindness for outsiders? She may have been raised on location, but heck, she was adopted, and she left for Harvard, and ... she's clearly not one of the boys, is she? If you've kept up with recent Irish detective fiction by, say, Tana French or Stuart Neville, BLACK IRISH will fit your collection -- even though the action takes place in the States, its ties to the IRA and "the Troubles" increase, along with the violence and stubbornness of the people around Detective Kearney. Her own struggles with inside/outside status mirror the joy and the darkness of Irish history and heritage. And along with strong drink, Abbie finds connections and clues at the local Gaelic Club. Her partner Z, short for Frank Zangara, already knows her tendency to overcommit and to plunge into true Irish depression. But will Z still believe in her when all the evidence is against her? I couldn't put this one down. The pace is brisk and relentless, the action highly believable, and the layers of Abby Kearney make a detective that I want to read again. Although the book ends softly, without hinting at a sequel, the cover blurbs say "thriller series" and I'm sure Talty has more in the hopper. Which, by the way, is an excellent reason to read his first thriller right away ... to be ready for the next one. It's a pleasure to settle into the hands of a pro and realize there will be twists, tension, and police risk ahead -- American Irish style. 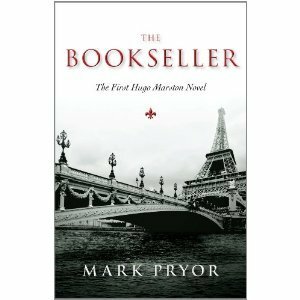 Mark Pryor: Two Hugo Marston Novels -- Paris and Crime! Lucky, lucky me ... 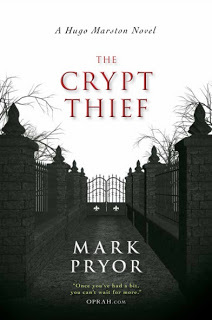 I picked up Mark Pryor's new book THE CRYPT THIEF, the second Hugo Marston detective novel -- and I hadn't known about the first one! So as soon as I finished one, I devoured the other, also. You know how a really good meal gives you a calm sense of goodwill? So does a pair of good books, one after the other. Ah .... I might just read poetry for the rest of the week (well, maybe not, but it feels that good). Hugo Marston is a delightful investigator, intense, highly skilled, and very believable. A former FBI profiler, he's switched careers to provide security to the US Ambassador in Paris, a much less risky, less dark endeavor. Moreover, his Ambassador is smart, sane, supportive -- life could be simple and honorable and ... clean. Even if not always fortunate in terms of love. But in The Bookseller, a shabby strreet-level bookseller who has shared many a good book (at good prices) with Hugo over the years gets kidnapped at gun point. And Hugo Marston may be the only witness, and one unable to do anything about it. The Paris police won't buy into the case; somehow there are Nazi hunters involved; old books play a role; and so does Hugo's new relationship with a beautiful and savvy reporter. It's a classic detection novel, played out in France, and worth every turn of the page. Then comes THE CRYPT THIEF, where Marston's profiling skills are called into play as someone incidentally kills two tourists in the famous Pere Lachaise cemetery -- while stealing bones. Marston's former FBI buddy Tom Green, an intense and somewhat damaged CIA operative and consultant but a good friend (who also appeared in The Bookseller), arrives for a long visit and assumes Hugo will put up with his drinking, his despair, and his bad decisions. As Marston's investigation picks up pace and focuses on a clever and powerful serial killer, will Tom's rash behavior capsize the operation? And what are the risks of allowing Claudia, the reporter who's backed away from Marston, back into the press of events? By the way, here's author Mark Pryor's website. Have fun -- and if you've already enjoyed one or both of these, do add your thoughts on the series as a comment here, s'il vous plait. In a perfect world, the law of the land would echo what our hearts tell us: Love and peace, and friendship above all, would determine what's right to do and how to give. But as Liz Rosenberg makes clear in THE LAWS OF GRAVITY, even the most caring and tender judge must wrestle with what's been written down. 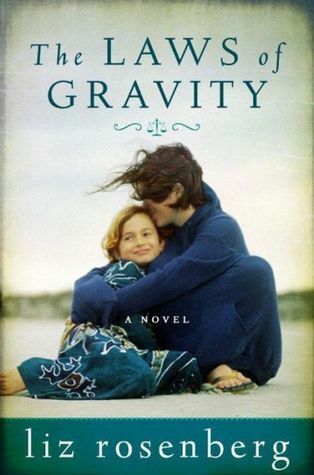 And for Nicole and her adored older cousin Ari Wiesenthal, the weight of the law may fracture the family bonds that have kept them close into adulthood, into the years when each is a parent. She knit faster, as if she could push the story away with the clicking speed of the needles. "That mother died before her daughter even reached third grade." "There's nothing scarier than having kids," Mimi said, her dark eyes wide. "Halloween can't touch it." "I know. But just think --," Nicole began. "I can't," Mimi said. "I won't. And you shouldn't either. Everything to do with having children is terrifying. You can't afford to sweat the details." But for Nicole, the details are suddenly front and center, as the lump turns out to be an aggressive cancer, and treatments don't work well. Luckily, her cousin Ari stored the cord blood -- that special blend of magically fertile stem cells that hesitates in the umbilical cord at birth -- of one of his children, deep frozen for emergencies, should that kind of crisis ever arrive. And the cord blood could help Mimi survive after all. But Ari, at first glad to contribute, confronts an emergency for one of his own children and suddenly realizes he needs to keep that cord blood for them, just in case. Mimi actually has a contract of sorts that Ari provided, saying he'd donate the blood. What will it cost her at the level of her soul, if she takes that document to court to sue for the cord blood? Liz Rosenberg is known as a poet and a thoughtful reviewer of young-adult novels. Here she spins a lush novel of women's friendships that tackles the legal and medical issues usually found in the high-stakes thrillers written by, say, Jodi Picoult. But Rosenberg shifts the pace as well as the setting -- to Long Island, where she grew up, and to the cultural frame of modern Jewish life -- in order to deepen the issues and test their costs. Readers with some experience in terms of Jewish thought will already have pricked up their ears at the surname Wiesenthal for Nicole's cousin Ari. Even more pressing is the name of the judge who accepts the case that Nicole brings: Judge Solomon Richter. "Richter" is German for judge, based on the word that means what is right; Solomon, of course, is often remembered for his wisdom in deciding which of two claimants was actually the mother of a baby being fought over. And Rosenberg is a poet -- not only the names, but each word in this powerful novel has been selected by eye and ear. To reach the eventual resolution, not only the characters but also the reader will test what justice means -- and also love. Although this book came out last December, there hasn't been a lot of talk about it, so I thought I'd mention it as a potential cross-genre mystery for the summer reading stack. 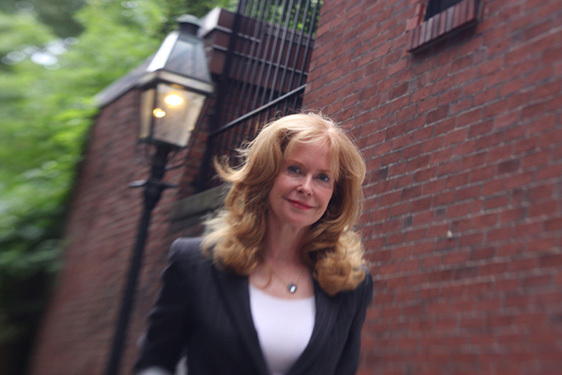 "Shelly Dickson Carr" is the pen name of Michelle Karol, a Boston-area theatre lover, and this is her first book. But if you've been reading mysteries for a while, or tend to read mid 20th century authors, you're already wondering how this author came to claim her nom de plume -- because John Dickson Carr (1906-1977) was one of the fine and very productive mystery writers of the so-called Golden Age of the genre. And the answer is: Shelly Dickson Carr is his granddaughter. 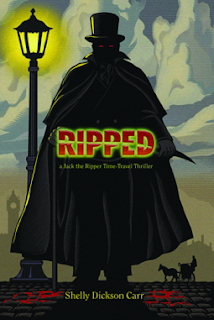 RIPPED, her first book, involves time travel and Jack the Ripper's London. It's a thriller, with gory murders, risk, suspense, and a fifteen-year-old protagonist: Katie Lennox, whose parents are dead, whose sister is a rock performer and not around, and who's living in teen misery with her London grandmother. Things look up a bit when she meets "seriously hot" Toby, who teaches her Cockney rhyming slang while they wait to enter Madame Tussaud's wax museum to see the grotesque Chamber of Horrors -- a restaging of Jack the Ripper's murders of young women in the 19th century. When a Katie finds herself tossed abruptly into the days of the Ripper, she's bold, committed, and smart. But can she handle time travel, a vastly different way of life, and psychopathic threats, all while working out her own life and trying to save (in a strange way) her sister?? Pull this one onto your list if you collect Jack the Ripper; if you adored John Dickson Carr and his mysteries; or if you're in a parent-daughter reading group. At a chunky 500 pages, there may be a few sections you speed-read to get to the next tangle -- and by the end, you'll know a lot of Cockney slang! (In fact, the author provides a primer on her website.) As Katie discover in the second chapter, it turns what you know inside out: "I'm no one's lamb to the slaughter, Katie thought, because my parents are brown bread ..." Need a hint? The last word in "lamb to the slaughter" rhymes with daughter -- now, do you know what rhymes with the latter word in brown bread? Making a list, or better yet, a stack, for summer reading? If you enjoy a mystery that's layered with complex clues and twists, and at the same time makes you chuckle out loud, I can recommend the three-book series by Timothy Hallinan (yes, the same Timothy Hallinan who writes the Poke Rafferty mysteries): the Junior Bender mysteries, Crashed, Little Elvises, and The Fame Thief. We already reviewed Crashed here, with the recommendation that it was good enough to pre-order (yes!). So here's a bit about Little Elvises. Junior Bender, a clever career thief with a reputation to maintain, often works for hire, so to speak -- someone wants a particular high-end item, like a fine painting, and Junior targets, removes, and markets the item in a smooth sequence. His tricks for entering unoccupied homes are diverse and well timed. He isn't wild about his career choice when it comes to trying to get back into his daughter's good graces, not to mention his ex-wife's ... but he takes pride in his skills. So as this volume of his exploits opens in Southern California, Hollywood area, it's partcularly galliing to Bender that a police officer is creating a case against him for a theft he didn't do, and wouldn't have -- because there was a gun involved. Junior Bender doesn't use guns. Everyone knows. What everyone doesn't know, though, its that DiGaudio, who is putting the screws onto Bender in a police station cell, has relatives who are ... shall we say, mobbed up? Well, DiGaudio won't say that. But Junior Bender is getting the message: DiGaudio wants Bender's skills for a job to salvage some reputations. Bender's even being pushed about his 13-year-old daughter and what she'll think of him if DiGaudio tags him with a much nastier crime than he'd ever actually commit. Interestingly, Bender's daughter already knows something about what the complications are -- that is, what "little Elvises" are. She's written a paper for school on "the way American pop culture imitates itself, the way it stamps out little tin copies of anything original that makes money. The example she chose was all the little Elvises from Philly who were churned to the surface in the wake of Elvis Presley." Hallinan's deft plotting soon tangles Bender into the saddest and most dangerous parts of the studio music scene, as well as -- could it be? -- mob connections from multiple locations. And all this, while Bender's daughter is getting involved in the actual detection, because, of course, she's so much better than her dad at all the Internet stuff that suddenly turns out to be necessary knowledge for him to survive DiGaudio's quickly closing net. If that's even possible. Well, you know it must be possible -- I've already said there's a third book. The Fame Thief comes out at the beginning of July, just in time for vacation reading. But play fair: Read the first two books first, if you can! If you enjoy the best of Lawrence Block or the capers that Donald Westlake wrote (or, not to be gendered about it, Bethany Maines! ); get a kick out of Los Angeles crime fiction like Raymond Chandler's; and appreciate a well-played hand of characters whose mistakes feel very, very believable, even though they're criminals and you're not (I hope!) ... then this is a series you'll enjoy. One quick mention: For some reason, the ribbon of text on the cover saying "A Junior Bender Mystery" has made a few people this this features a teen detective and belongs on the "young adult" shelf. Banish the thought! 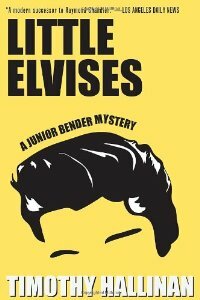 Gently raunchy, always amusing, and a page-turner that will keep you going even when the summer sun's heating up, Little Elvises is a heck of a lot of fun. For grown-ups.